This is a follow up to yesterday's post, "For the New Giver." While not necessary for everyone, I want to make sure I break this teaching down as far as possible, because it is one of the scariest and most counter-cultural. I am not teaching on Giving because I want your money, but because I want you to experience the joy of a generous heart. I want you to know the blessings that can only come through cultivating a generous heart. 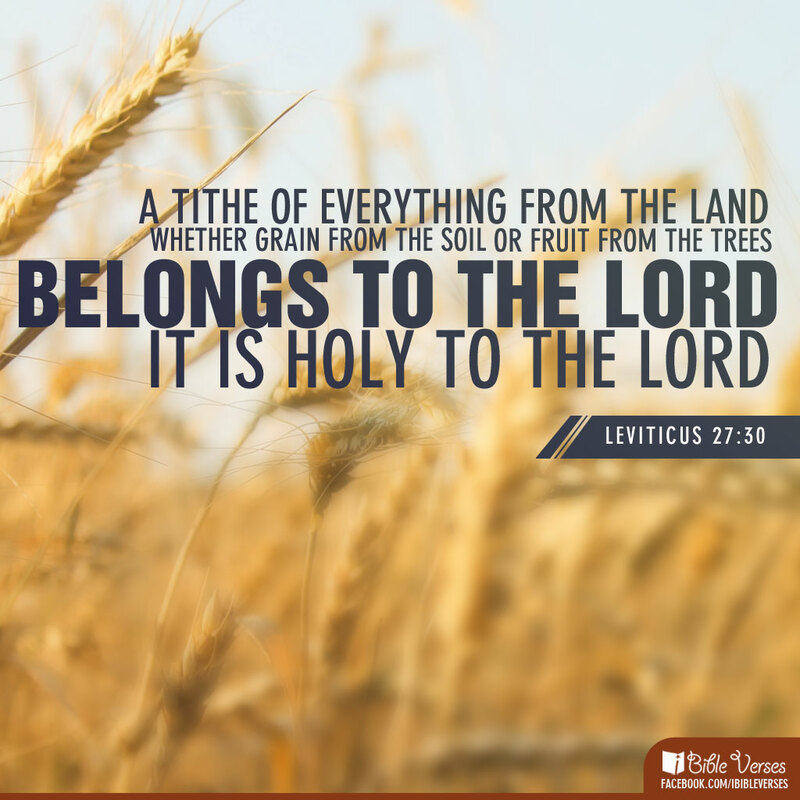 Tithe is an English word, derived from an Old English word meaning Tenth, which was in turn used to translate a Hebrew word, ,that literally meant one tenth or 10%. So, while people with through the term around loosely to describe a gifts to the Church, tithing is the practice of giving 10% of my income back to God, mainly through my local congregation, but also to the poor directly. 2.) Do I have to Tithe? No you do not have to tithe. It will not get you into heaven, Jesus’ death and your faith in that death save you. But you will struggle to grow in generosity, and apart from giving you will constantly feel the burden of not having enough, whether you make minimum wage or a million dollars. People that do not give sacrificially, feel perpetually poor. Many folks will say that the Tithe is an Old Testament Law that we are freed from by Jesus and the Gospel of Grace. I think that is true. Still, when Jesus criticizes Pharisees that religiously give 10% of everything including table spices, he does not say, "Stop observing the tithe, that get's it all wrong. Don't you know its all about grace!" Instead, Jesus points out that the Tithe was never about following the rules, instead it has always been about the heart. So He says, "we should practice justice, mercy, and faithfulness without neglecting to also Tithe" (Matt 23:23). If that Bible Study's not convincing, another Presbyterian Pastor, John Ortberg likes to say it this way, "I can't imagine facing God one day and saying, 'I know back in the Old Testament days people gave a Tithe, and I know now, in addition to all the blessings they got, those Old Testament Scriptures and stories and heroes and the promise of your presence... In addition to all that, I have been given the gift of Jesus and the cross for my sake and the promise of resurrection and the hope of the Holy Spirit, and I think I'll ratchet my giving down 5 or 6 percentage points." 3.) Does Oakland expect me to Tithe? Jesus expects us to tithe. Not mechanically, but thoughtfully and intentionally to fight greed and indifference in our hearts, and injustice in our world. One a different note, Shriners, Rotarians, Scouts, and Gyms all force members to pay dues; we do not because we believe than anyone who understands the gospel, will naturally feel compelled to give. 4.) What if I cannot give 10% right now? First, some good reasons not to give 10%. If you are unemployed, and not yet receiving unemployment or severance checks, then you have no income to tithe on. If you are a student living entirely on Student Loans, then likewise you have no income to tithe on. However, I would encourage you to START NOW giving a percentage of all income from part-time jobs. According to one report, 63% of people who tithe, started to do so between childhood and their 20s. Still, if you cannot give 10% now without losing your car or your house, don't lose your house or car. Figure out what you can give. $10 or $100 a month and also try to give your time disproportionately, while seeking to rearrange your budget to rebound from bad financial decisions. 10% is not currently a realistic option for you, mainly because of overcommitment, but through a Dave Ramsey Financial Peace Course, it very well could be a reality in as little as 6 months to a year. Don’t beat yourself up, remember, 2 Cor 8:11-14 says, “Give on the basis of what you have. If you really want to give, then the gift is measured by what someone has. It is not measured by what they don’t have. We don’t want others to have it easy at your expense. We want things to be equal. Right now you have plenty in order to take care of what they need. Then they will have plenty to take care of what you need.” Right now you might need other believers to supply your need, and that is ok. 5.) What if 10% of my annual income is greater than the entire Church Budget? Well first off, praise God. Second, you especially need to give by percentage, because the temptation to give by amount will be astronomical. Though folks disagree with me, you may divide your gifts among other ministries, but personally, I would not give less than 5% to my local church, even if that is greater than their entire budget. Oakland will not hoard your wealth, but abound all the more in giving. We would like to give away a third of all the money coming through our doors. On a more personal level, such a gift demonstrates your commitment to the community, and your trust in the leadership to use your gift in God honoring ways, just as everyone giving a greater percentage but smaller amount, must trust the Church to faithfully use their money well. If you trust other ministries or secular organizations to steward your gift more than you do your local church, then we really need to have a conversation. For more information on Tithing, check out the sermon, "Live to Give: The Test" by John Ortberg of Menlo Park Presbyterian Church. Pastor John is a great teacher and is especially passionate about Generosity and Tithes. This is not an exact science nor is it LAW. Think of the tithe, not as a task to accomplish, but as training wheels to liberate you into generosity. Remember, God is more concerned with our hearts than the letter of the law. I’m young, and relative to many of you, poor, but relative to many of our neighbors, wealthy. Relative to the world, very, very, very wealthy. Therefore, when the Bible addresses "the rich" or "rich people," I assume it is talking to me. I do not have all the answers, and the ones I do have, I got from older, wiser, more generous men and women like you. If you have thoughts, comments or questions, please come talk with me. Posted in Pastor Andrew's Blog and tagged Called to Give, Generosity, Giving, In God We Trust, Live to Give, Stewardship, The Way of Jesus, Tithe.